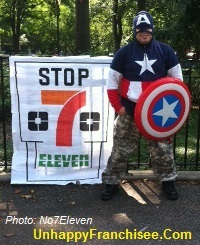 The 7-Eleven protest group No 7-Eleven is increasingly vocal, tenacious and creative in its opposition to 7-Eleven’s expansion in New York’s East Village. 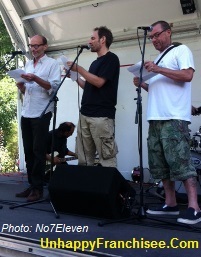 The No 7-Eleven group demonstrated this past Saturday and Sunday (August 2 and 3) in New York’s Tompkins Square Park as part of the 25th Commemoration of the Tompkins Square Park Riots. Members of the group performed an original skit (see below) penned by playwright Sugar Di Abetes, which they referred to as the “Margaret Chabris skit” in honor of 7-Eleven, Inc. corporate public relations spokeswoman. No 7-Eleven shared with us “the expurgated version of the ‘Chabris skit’ [vulgarisms removed]” by Ms. Di Abetes. Local: You own this 7-Eleven? Lady from Texas: [Heavy out-of-town accent, very polite] Why no, sir, I am the corporate spokesperson for 7-Eleven. Local: Oh yeah? Where you from, lady? Lady: I’m from the Great State of Texas, thank you. Visiting here to check up on one of our target locations. Local: “Target locations.” Look, I own this bodega right here next door — no not over there, RIGHT HERE NEXT DOOR. Are you crazy, lady? Lady: Well, our corporate headquarters — in the great state of Texas — feels that your neighborhood is underserved. Local: Underserved. I serve them right here. I already gotta compete with the deli down the block and the bagels store across the street and the yuppie cafe on the corner. And the yuppie cafe on the other corner. Yeah, and the yuppie cafe on that corner too. No the other corner over there, that’s a pet store. They don’t compete with me — they serve coffee only to cats and dogs. Lady: Well sir, [a little testy in her genteel Texas manner] the corporate strategy of the great state of Texas is to target your lovely neighborhood. Local: Yeah, well it used to be better. Do you have a clue where you are? Lady: Well it says here on our corporate app-map app that this is the [pronouncing firmly stressing each word with a nod] “East Village.” Now that does sound charming doesn’t it? Is there a North Village? I’d love to visit there while I’m here, you know. Love to see your charming and beautiful city. Local: “East Village” [annoyed now]. Lady, this is no “village.” This is Loisaida. Alphabet City. Lady: Loisiada… Now I don’t see that in our map app. I mean app map. Local: [Disgusted] APP MAP APP. [Restraining himself, nicely] Look, you seem like a nice lady. You have a nice app map app. You wear some fancy ropa and I can see you gotta lotta dough. You speak very nice. [Lets loose waving his arms wide] So why are you trying to drive me out of business? Lady: Well, [cautiously] sir, [sweetly] you might could convert to a 7-11. Local: A 7-11. Right next door to a 7-11? Now what kinda sense does that make? Lady: [Explaining as if it makes perfect sense] Well, that’s all part of our target strategy, sir. If there’s a [consulting her iphone and pronouncing carefully] bo-dee-ga nearby, then there’d be competition. We can’t have competition, you know. We won’t succeed with competition. Oh no, no, no. Competition, oh competition’s very bad. No, no, no. That wouldn’t make our corporate headquarters in the great state of Texas very happy. And you know we mustn’t make them unhappy in Texas. Local: Jeez. Why the … Why do I care about Texas?? Customer: Mahmud! Washappenin? How you been brother? What’s this? Local: It’s the new store. Believe it? Customer: [To Chabris] This your new store? Lady: Yes, sir, young man. Local: So how is my store going to survive if I convert it to a 7-11? Lady: Well our corporate head quarters in the [both say it together] great state of Texas will subsidize your store until aaaaaaaaaaall the competition is dead. Lady: Well then you know…. Local: Like Starbucks what? We’re gonna serve yuppie coffee all day? Lady: You know…closed the excess. 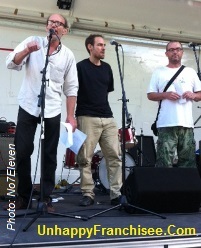 Local: The excess. That’s me. Lady: We close your store. Lady: From the great state of Texas! Lady: Oh, like the Brooklyn Bridge? We bought that and we’re very happy about it. Oh yes very happy. Such a pretty bridge. We’re planning to put our logo there, so pretty. Local: [Wipes his hand over his face in exasperation, leaving.] Holy Jesus! Lady: [Plays with her app map app. Occasionally glancing over the audience to her pretty bridge.] Such a pretty bridge and such a lovely neighborhood! And won’t 711 be a good local friend here…? WHAT DO YOU THINK? ARE YOU FAMILIAR WITH THE 7-ELEVEN FRANCHISE, 7-ELEVEN INC. AND SEVEN AND I HOLDING CO.? PLEASE SHARE A COMMENT BELOW. LA WEIGHT LOSS: They’re BA-A-CK!